The campaigns to keep the UK in the EU – Britain Stronger in Europe – and their Eurosceptic opponents – Vote Leave – have now had almost a month since the launch of the official referendum campaign to outline and hammer home their key arguments for why we should vote to stay in or leave the EU in six weeks’ time. This research project has spelt out some of the challenges they face, particularly in their efforts to win over the youth vote, including: the need to overcome both the lack of interest many young people have in the referendum itself and their lack of trust in the campaign messages; the need for the Remain campaign to make sure their sizeable chunk of young supporters actually turn out on polling day; and the need for Vote Leave to convince more young people – who tend not to share the hostility towards immigration of most Leave supporters – that there are other reasons besides restricting the number of immigrants to leave the EU. As polling day draws nearer we can assess the success of the campaigns in overcoming these various challenges, and this will be the focus of several blogs over the coming weeks. We can begin with the overall support for staying in or leaving the EU. 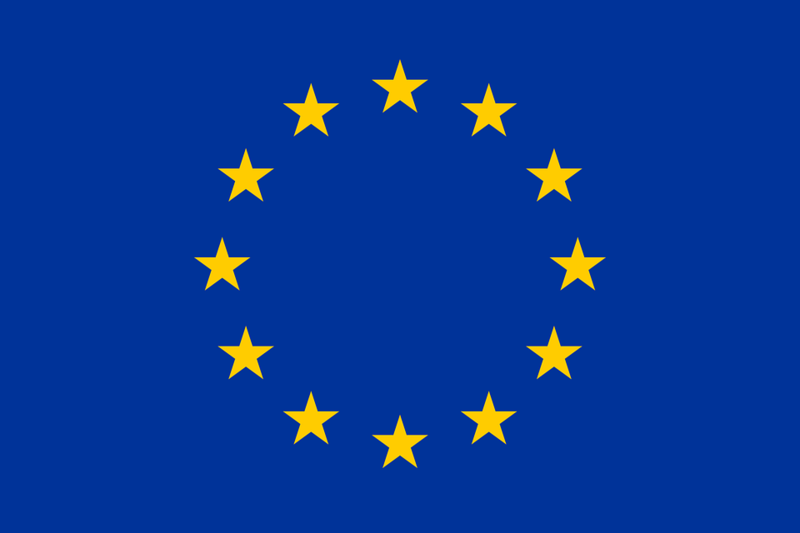 The headline figures of recent opinion polls repeatedly suggest that they are almost neck and neck, with perhaps a slight lead for the Remain campaign, and that the overwhelming majority of young people continue to back Britain remaining in the EU. If we look a little deeper, however, at how certain people are of how they will vote in June, the picture is a quite different. 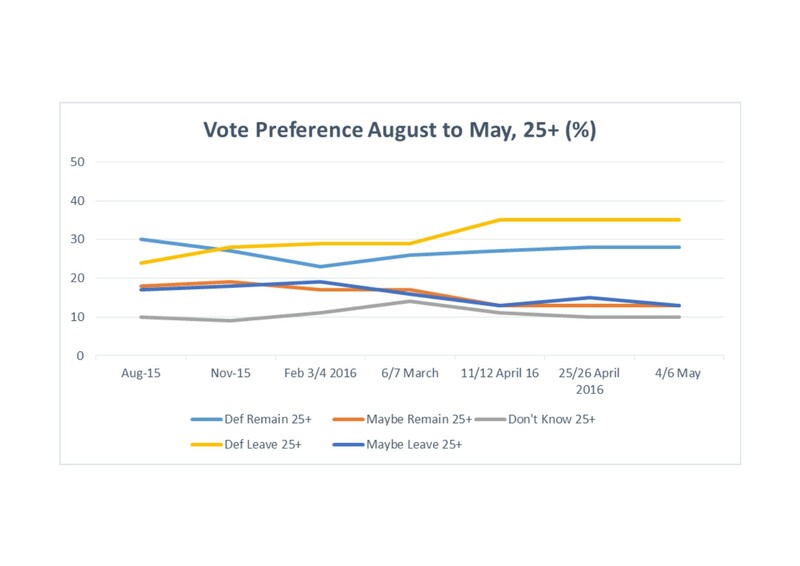 The graphs below show support for staying in and leaving the EU, broken down by how certain survey respondents are that they know how they will vote, for the 18-24 year olds and the over 25s between August of last year and early May 2016. Respondents were asked how they intend to vote in the referendum, and could respond with one of the following choices: definitely vote to stay, probably vote to stay, might vote to stay but not certain, don’t know, might vote to leave, probably will vote to leave, definitely will vote to leave. 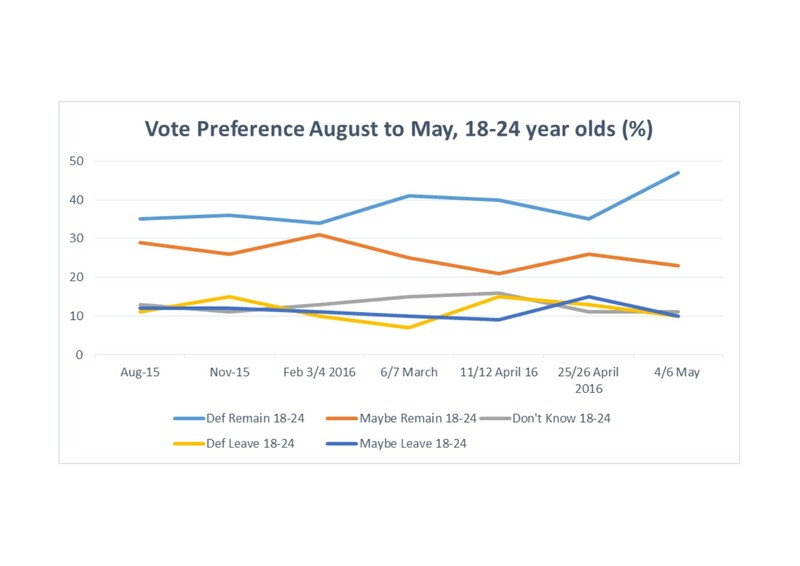 Looking first at the under-25s, we can see from the first graph that their support for EU membership is becoming firmer. In August, 35% of 18-24 year olds were certain that they would vote to remain in the EU, while 29% probably would or might vote to remain. By May this year, the figures had shifted to 47% and 23% respectively. Taking the ups and downs in these figures over the nine month period into account, there was an average increase of 1.3% a month in the proportion of under-25 year olds certain to vote to remain, and a decrease of 0.7% in those who probably would or may vote to remain. There was also a slight decline in support for leaving the EU: 11% were certain they would vote to leave the EU in August, and 12% probably or may have voted to leave; by May, these figures had fallen by an average of 0.2% and 0.1% a month to 10% each. The proportion of those who had no idea how they would vote has also fallen, from 13% in August to 11% in May, at an average rate of 0.2% a month. These shifts suggest that the 18-24 year olds are becoming, albeit gradually, more supportive of Britain’s membership of the EU. That is not the limit of the good news for the Britain Stronger in Europe campaign (or of the bad news for Vote Leave), however, because the more confident someone is in how they will vote, the more likely they are to actually vote on polling day. Our data shows, for example, that of those 18-24 year olds who are certain to vote to either leave or remain in the EU, 70% report being certain to vote on polling day, compared with 48% who will probably vote to stay or leave, 20% who might vote to stay or leave, and just 18% who do not know how they will vote. 18-24 year olds are not only becoming more likely to support staying in the EU as the campaign runs on, therefore, but also more likely to express that support in the polling station in June. The picture for the rest of the British electorate is quite different. While young people are becoming more supportive of EU membership, the over-25s are becoming more hostile towards it. In August 2015, 24% of over-25s were certain that they would vote to leave the EU; over the following nine months this increased by an average of 1.3% a month to 35% by May 2016. At the same time, the proportion who probably or might vote to leave the EU fell by an average of 0.2% a month from 17% to 13%. In addition, the proportion who were certain they would vote to stay in the EU fell from 30% in August to 28% in May, and the proportion who probably or might vote to remain fell from 18% to 13%. Alongside a gradual shift towards supporting withdrawal from the EU, there has also been a growth in the proportion of over-25 year olds who are ‘certain’ of how they will vote in June, from 54% in August to 63% in May. That means that not only are the over 25s becoming more Eurosceptic as the referendum campaign wages, but they are becoming more likely to vote to express that Euroscepticism. The efforts of the Remain and Leave campaigns are being met, therefore, with mixed success. Britain Stronger in Europe and its supporters are successfully exploiting their advantage among the pro-EU young generation, and managing to persuade more of them that they should vote on polling day. At the same time, however, its support among the over-25s is being slowly eroded as more and more older people back Vote Leave and become more likely to express that support on polling day as well. While the campaign battle might look like a score draw so far, these results do not bode well for those who wish to see Britain remain in the EU. As this research has shown, despite their strong support for EU membership the under-25s are typically far less likely to vote than their elders in the referendum, even despite the growth of those certain of how they want to vote. The shifts highlighted above show that the support base of those who wish to remain in the EU is becoming (albeit slightly) more dominated by those who are less likely to vote in the referendum than their Eurosceptic elders.